Sensor Unlimited uses Netvibes Dashboards to help government agencies analyze diverse information sources online, delivering real-time insights to help drive better policy decisions. 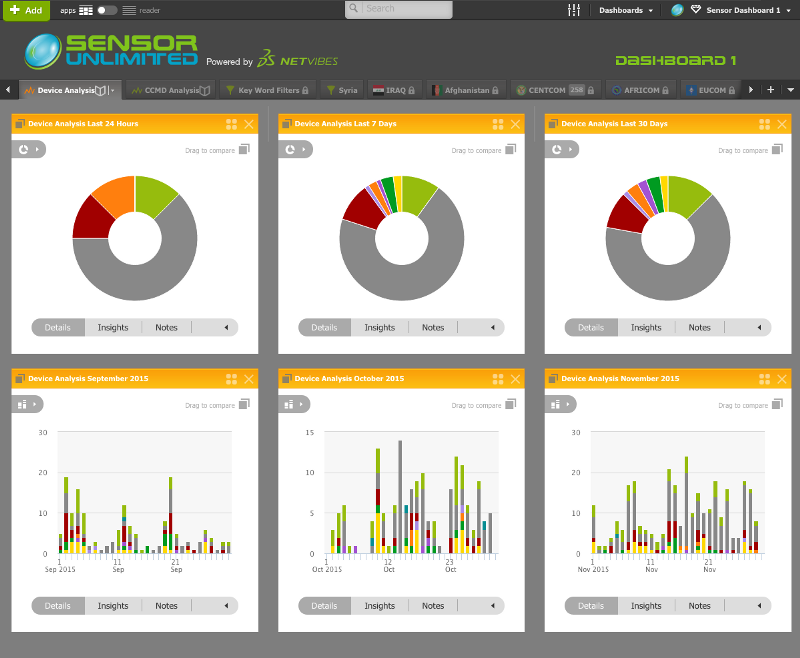 Sensor Unlimited, supported by Netvibes Dashboards, has been changing the way that government organizations are collecting, data mining, analyzing and visualizing data. Sensor Unlimited listens to its government clients, and is leading the way into the future of cross-agency collaboration capabilities. Together, Netvibes and Sensor Unlimited transform millions of conversations taking place online (including articles, social media, forums, videos and more) into powerful data insights that help government organizations to better serve constituents. Government agencies are attempting to monitor a wide array of information sources in order to analyze and visualize information relating to topics ranging from terrorism to gauging the pulse of their “customers” (the general public). Government agencies know that to meet this objective and be able to collaborate their research, they need a flexible solution with responsive services, superior support and the ability to leverage their own development teams. The large amount of data on the Internet also requires a solution that is able to intuitively data mine through the “noise” to gather and analyze valuable information specific to the user. After testing a multitude of the different Dashboard capabilities currently on the market as potential partners, Sensor Unlimited found that Netvibes was by far the most innovative and technically superior product to use for fulfilling the needs of a wide range of customers with greatly varying problem sets. A dynamic front page has acted as an anchor point for many of the government watch centers that Sensor Unlimited supports. Weather and government closures keep employees informed on the same page that also displays the hot items or urgent projects that need attention as soon as users log in. As a result, employees are immediately aware of current action items, which allows them to maximize their time and deliver better results. Because Netvibes enables users to pick the data sources they wish to monitor (the Personal Corpus), Sensor Unlimited has customized the Dashboard to track 2,000+ news sources, plus major social media sites (Twitter, Facebook, YouTube, etc.). All of this information is collected by Netvibes and aggregated into a single Dashboard where users can search for specific information, track important topics, or identify new trends and influencers, allowing analysts to drill down and quickly pinpoint the information that they need to drive decisions. Netvibes Dashboards give users the ability to track metrics and create custom charts and analytics to monitor trends and discover correlations. The dashboard’s simple drag-and-drop interface enables analysts to instantly compare two streams of information and accurately visualize the relationship between datasets. Sensor Unlimited's government customers widely utilize Netvibes' intuitive Opinions tagging system, which can be customized to track current topics. Adding an Opinion to an article allows for further analytics, reports and visualization of information. The authors of Opinions can also be tracked, enabling organizations to see which employees are leaders in opinion-sharing. Clients see the added benefit of multiple data streams, pictures, videos and pictures to help track, understand, and visualize major events as they occur. The ability to track everything in one place allows users to save valuable time in critical moments. Because social media often provides information up to 4 hours prior to traditional news media, the Dashboard provides early alerts for breaking stories.